We all know that there are plenty of things to see and do in Honolulu but here are 7 Things to Do on Oahu Hawaii besides surfing. I’m going to make the bold assumption that you know what beaches to go to when you visit Oahu, but there is so much more to this island. We visited Kailua Beach, as this is one of the most beautiful beaches and an excellent kitesurfing spot. We attended an authentic luau with island locals, tasted chocolate made in Hawaii, swam under a waterfall, practiced yoga on the beach and I ate my first Alohasada. My absolute favorite thing to do in Oahu was to sail out to the sandbar and spend the night on Kaneohe Bay. In no particular order, here are 7 things to do on Oahu Hawaii besides surfing. If this is not your first time to the islands of Hawaii, you’ve probably attended a luau that was offered at a hotel. My husband and I had the honor of attending Chiefs Luau, a very authentic luau and according to many, the #1 rated luau in Hawaii. What makes Chiefs Luau unique? Chief Sielu Avea and his ohana (family) are a tight knit group of island residents. Chief Sielu is not only a world champion fire-knife dancer, but his other dancers have been mastering their craft for many years. I had a chance to speak with Peleseuma, one of the fire-knife dancers before the luau and asked him how long he’d been a fire-knife dancer. He said he’s been dancing since as long as he can remember. The Polynesian luau includes a mix of island culture with story telling, local Hawaiian music, luau foods and typical Hawaiian cuisine. I’ve been chocolate tasting in El Salvador and I’ve sorted and processed cacao beans in the Dominican Republic, but I didn’t know there was a bean-to-bar chocolate factory in Oahu. In fact, Manoa Chocolate offers bean-to-bar manufacturing and chocolate tasting tours. Reservations are required for booking a chocolate tour, but if you don’t have time for the hour long tour (available in English or Japanese) rest assured that you’ll have plenty of chocolate samples to taste if you belly up to the chocolate bar. Be warned, this chocolate comes with a steep price tag, but the bars and truffles are really good. My personal favorite was the Ali’i Kula Lavender 60% dark milk chocolate but the chocolate truffle with sea salt was also a contender. Some people might call me a farmers market junkie; I need my weekly fix of fresh fruit, baked goods and leafy greens. Wherever I travel, I seek out the locals and many local residents shop at the farmers market. That may mean doing SLO Wine Country Like a Local in Central California or Oahu, Hawaii Like a Local. On this particular visit to Oahu we traveled to the Kailua Farmers Market held every Thursday evening at the Kailua Town Center. As per my usual routine, I scoped out the booths of Guava Smoked pig, produce stands with mounds of ripe apple bananas, baked goods made with poi and I circled back to Pig and the Lady for my dinner selection. Pig and the Lady Chef Andrew and Mama Le change up their menu weekly at the market so check their website for the nightly specials. Sailing is a way of life on Oahu, as the island is surrounded by water and the warm air creates Hawaii’s trade winds. 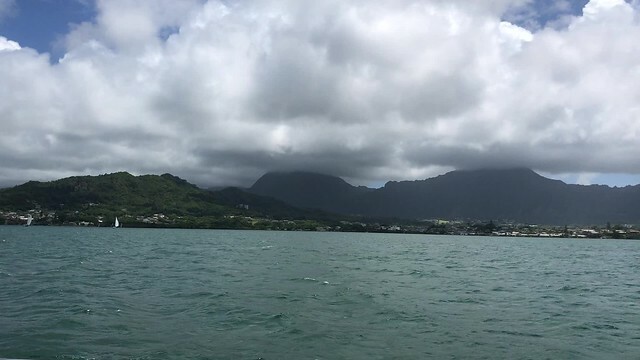 As a California girl, I love a San Francisco Bay cruise, but there’s nothing like the experience of sailing out to Kaneohe Bay and spending the night on Kaneohe Bay Sandbar. My husband and I had the privilege of sailing a 40 foot sailboat with our friends Ali and Mike Bacon. Mike Bacon is an accomplished sailor and we were celebrating his successful finish in the Pacific Cup Race. He and his partner sailed their boat from San Francisco to finish at their home port of Kaneohe Yacht Club. If you have a chance to go sailing on the bay or take sailing lessons, I highly recommend that you give it a try. Who knows, you might see dolphins, whales or sea turtles along the way. I am typically a non-drinker. When I go wine tasting, while I love a fruity Pinot Noir or a well-aged Cabernet Sauvignon, I always utilize the dump bucket. I am, what one would call, a cheap date. My cheeks turn a rosy red at the first sip of alcohol, but there is something that shouts VACATION when the Mai Tai cocktails come out, accompanied with a slice of pineapple and a colorful mini umbrella floated on the top of the glass. Some say Royal Hawaiian’s Mai Tai bar offers the best tasting libation, while others swear that the Halekulani makes the best mai tai. Where’s your favorite mai tai poured on island? Waimea Valley is located on the North Shore of Oahu, Hawaii. Horticulturist Duke Morgan, along with a team of staff offer visitors insights into this area of land that stretches from the mountains to the sea. The botanical garden is a plant lovers paradise, while Waimea Valley waterfall provides a beautiful backdrop for photos, as well as a place to cool off and swim at the base of the 40 foot waterfall. In addition to seeking out farmers markets, I try to practice yoga wherever I may be. Often times all-inclusive resorts offer yoga classes. I’ve also joined yoga classes on cruise ships and even at a dude ranch, but my favorite place to do yoga is on the beach! Imagine my excitement when I joined a full moon yoga class at Kailua Beach Park in Oahu, Hawaii. I learned about the free yoga class while reading a flyer on a bulletin board. Yoga on the beach is a great way to meet the local people on island. Insider Tip: If this is your first visit to Oahu, you might not know about shave ice, a very popular and refreshing treat unique to the Hawaiian Islands. Another well-loved dessert is malasada; a Portuguese confection of fried dough, coated in sugar. I had my first Alohasada (a mash up of ice cream sandwiched between malasada) at Uncle Clay’s House of Pure Aloha in Oahu. It was quite tasty! For additional insider tips follow Northern California Travel Writer @Nancydbrown on Instagram and Twitter. From the San Francisco Bay Area, Alaska Airlines, Hawaiian Airlines, United Airlines and soon Southwest Airlines will fly you to Oahu. For those who don’t care for airplane travel, consider taking a cruise ship to Hawaii. 7 Things to do on Oahu Hawaii besides surfing review and all photos by Travel Writer Nancy D. Brown. All opinions are my own.